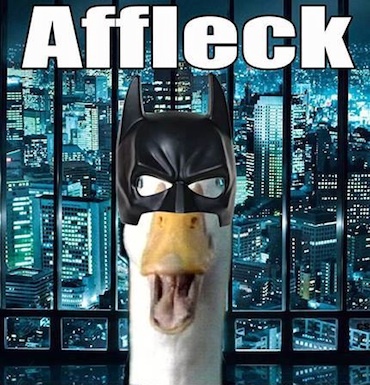 Ben Affleck Is The New Batman … How Does That Make You Feel? Zack Snyder impressed me with Man of Steel even though I was slightly disturbed that Superman put his poor mother through the ringer destroying her house, basically killing her husband and his adopted father by respecting his stupid prideful wish to die in a tornado and then barely offered her a hug as consolation before he flew away. Fortunately, Batman is going to save the day in the sequel, teaming up with Superman as superbros for DC life because they have to at least try to compete with Marvel. And who knows, maybe Joseph Gordon-Levitt will show up as Robin ala World’s Finest Comics? The role of Batman, best played by Michael Keaton and I guess Christian Bale, has been officially scooped up by Ben Affleck. This is all dandy with me because he at least has dark hair and a cleft chin and probably won’t talk in that horrible voice that Bale also used in Terminator. I have a vivid and highly obscure vision of Richard Burgi, who you’ll remember as Susan’s ex-husband Karl on Desperate Housewives (and a creepy lunatic in Hostel 2), as being the best, most manly and universally charming Batman ever. But that’s just me. This maybe the worst choice since Kilmer, no wait Clooney, other good actors not right for this role. Sometimes you have to be a Sir Michael Keaton!